You can’t go past homemade flatbreads. They’re warm and deliciously buttery, can be served with just about anything and are as easy as pie to make. It has become a weekend family ritual of ours to make these simple flatbreads. My little one loves measuring all the ingredients and getting his hands all floury, and the hubby simply chargrills them on the barbecue, which means I get to sit back with a hot cup of tea and a good book! This recipe is an adaptation from a Jamie Oliver classic, but I find tzatziki adds such a tangy, savoury note and pairs wonderfully with other BBQ favourites such as lamb kebabs or grilled marinated chicken. Measure 350g of tzatziki and blend until smooth. In a mixing bowl, add flour and baking powder to the blended tzatziki and mix well, bringing it all together with your hands. Given that all tzatziki mixtures will have a slightly different consistency, you may need a little more flour, so simply add a little more if the mixture seems a touch too sticky. Dust a clean work surface with flour and knead dough for a minute or so. It doesn’t need to ne kneaded for long, just long enough to bring it all together. Pop the dough into a floured bowl topped with a plate whilst you make the mint butter. Add butter to a small saucepan and slowly melt over a low heat. Add the crushed garlic and sauté until cooked through, then stir in the chopped mint leaves and set aside to cool. Cut your dough in half and divide each half into six portions, giving you 12 serves all together, each around the size of a golf ball. Gently flatten each one and roll into rough rounds 2-3mm thick. Use a knife to score a few lines in the centre of each bread, being careful not to cut too close to the edges. Grill each flatbread on a high heat on the BBQ or a griddle pan for 1-2 minutes each side until they are charred and puffy. 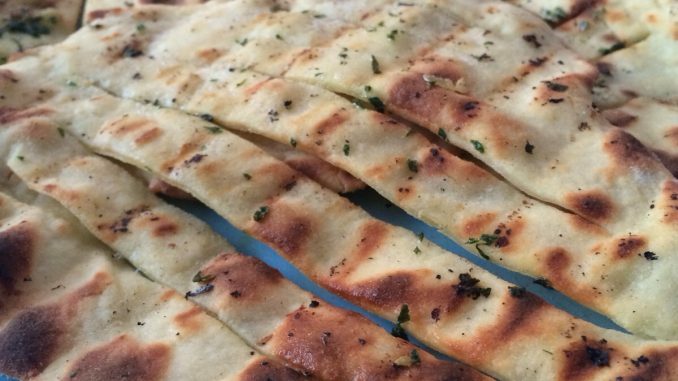 Brush hot flatbreads with garlicky mint butter and serve warm.